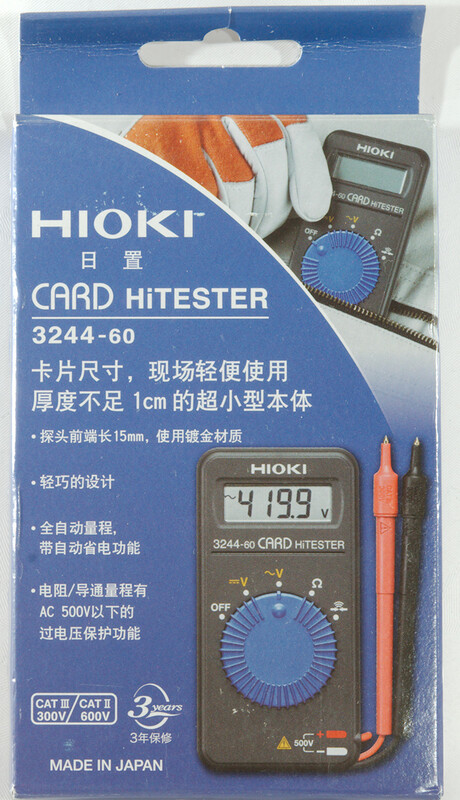 Hioki is a Japanese test equipment manufacturer, this is a small pocket multimeter with limited functionality. 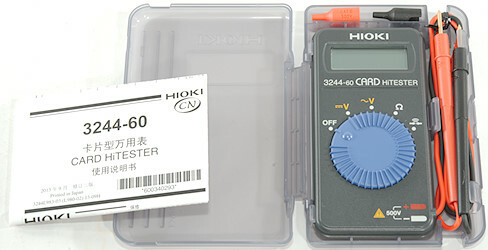 The meter arrived in a cardboard box with Japanese text on it. 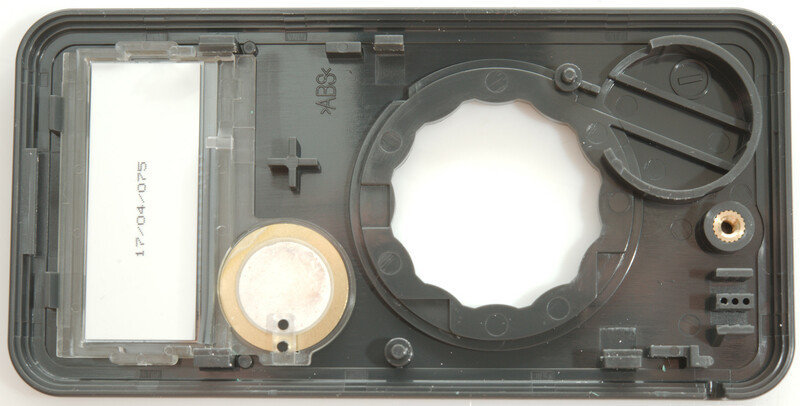 The box contained the meter in a plastic cover and a instruction sheet in Japanese and English (It is possible to download the sheet). 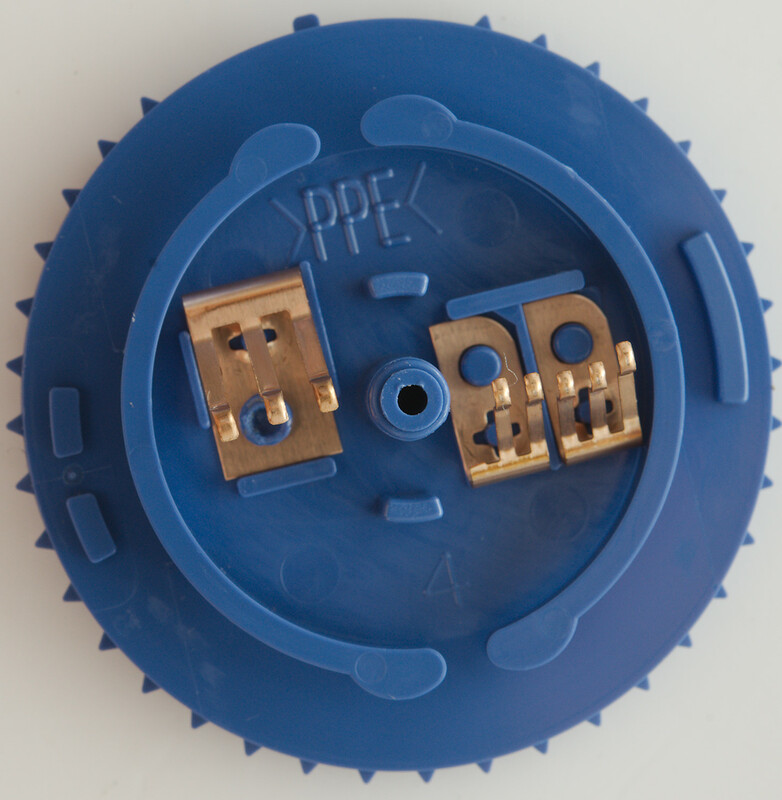 The probes has removable tip covers, with cover it is CAT III 300V, without cover it is CAT II 600V, but meter is only rated for 500V. 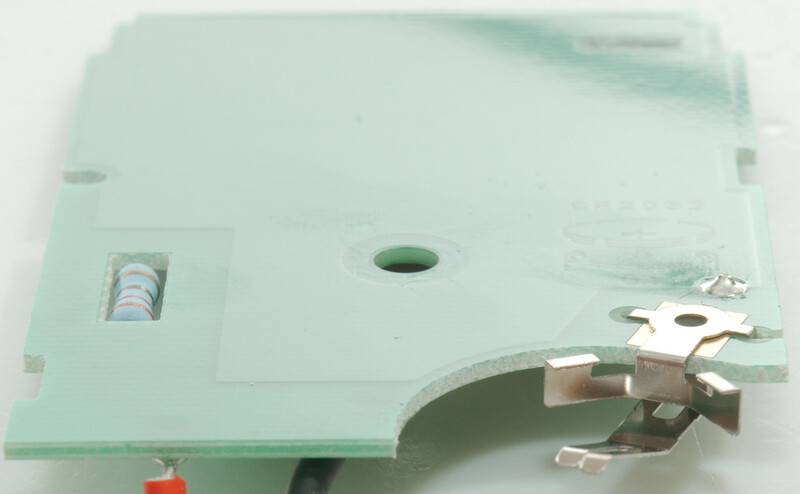 The range switch is easy to turn and there is a good detent to keep it correctly in the ranges. The manual fits inside the plastic box. 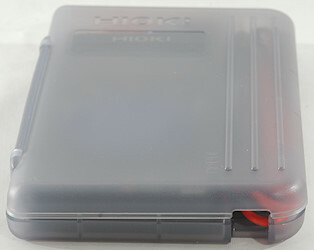 The tip covers can be stored inside the box (Very nice). 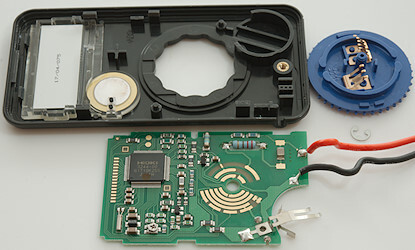 The lid can be folded under the meter. 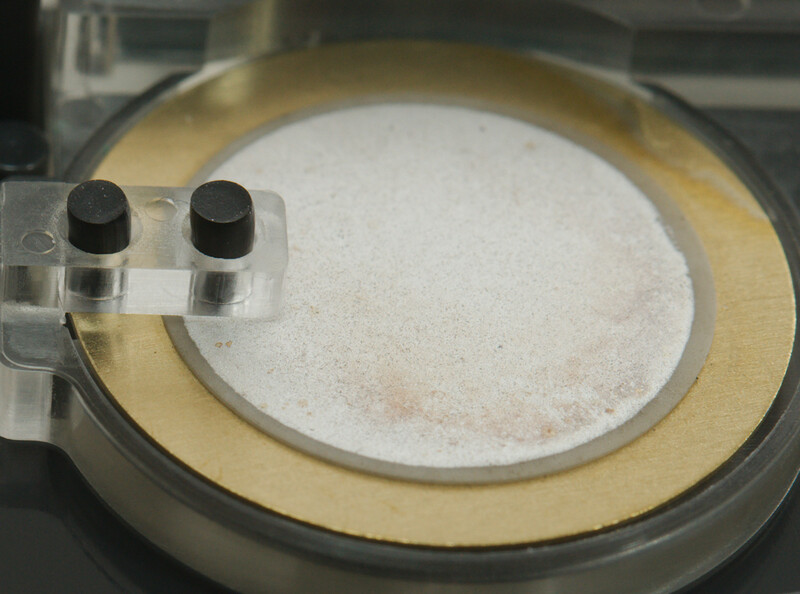 Or the lid can be closes with the probes sticking out, this gives a weak splash protection. : Continuity, voltage is high enough to light a led. 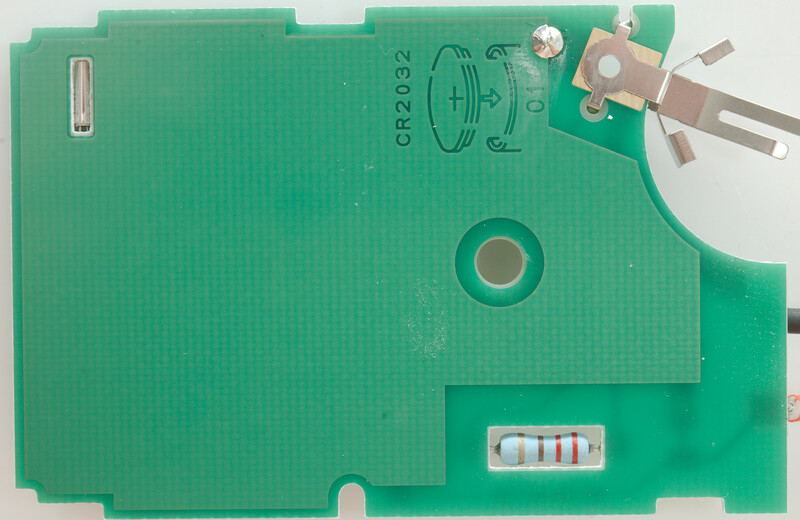 The probes is permanently attached to the meter. 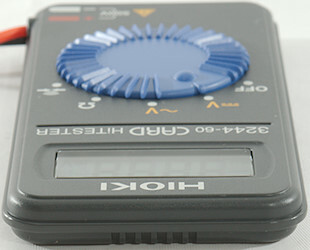 Input impedance is 10..11Mohm on V AC and DC. There is audible alarm when voltage is too high. 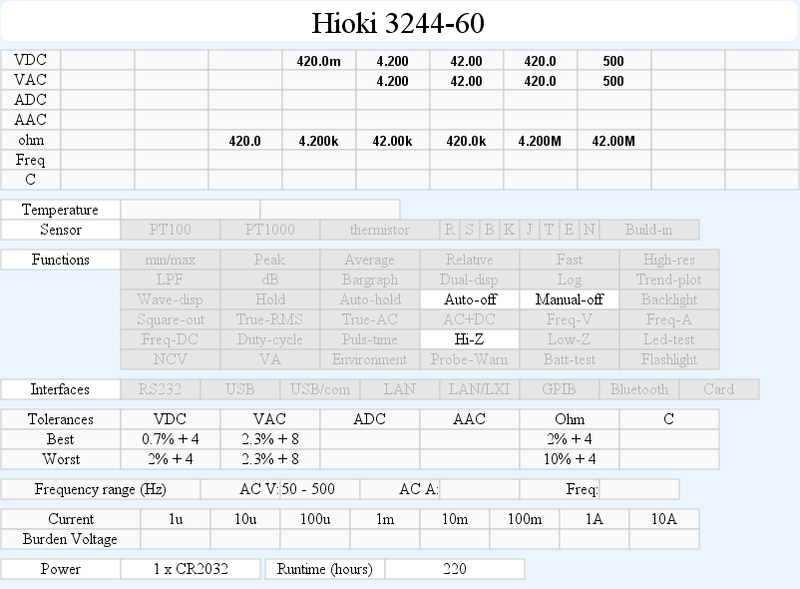 Continuity is moderate speed (About 60ms). 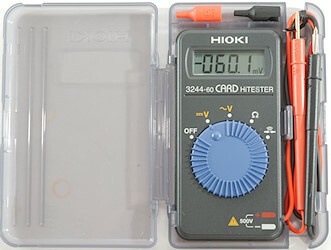 Meter do not have a diode test, but the continuity has voltage enough to light a led (Display will show OF on any diode except schottky). Meter "bibs" every time the range changes. 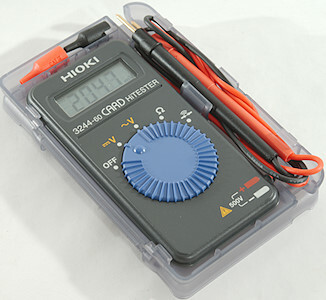 Meter works down to about 1.2V where display flickers significantly, battery symbol shows at 2.2V. 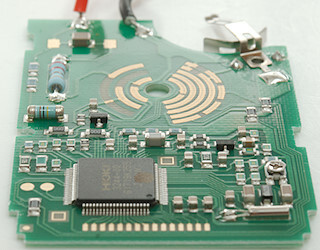 Reading is stable down to 1.5V and will increase below, at 1.1V the reading is about 200%. 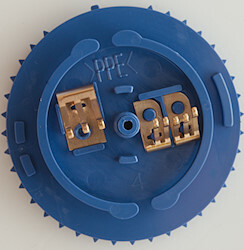 Meter will automatic turn off after 30 minutes, but it can be disabled. 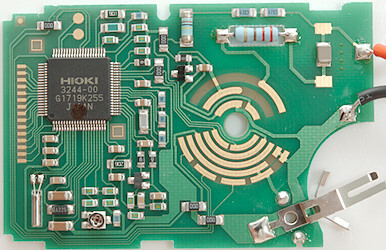 To disable auto power off the switch must be turned to continuity and then back to ohm after a short pause when switching on. Weight is 94.7g in box with batteries and tip covers (60g for meter with probes and battery). 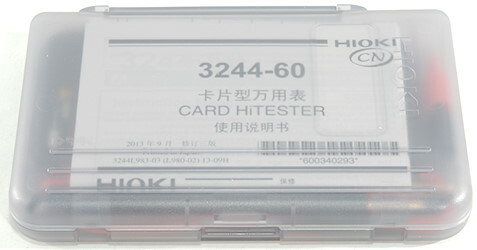 Size is 126 x 80 x 18mm in box (Meter is 109 x 55 x 12mm). 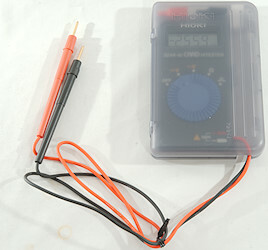 Probe wire is fairly soft and 46cm long. 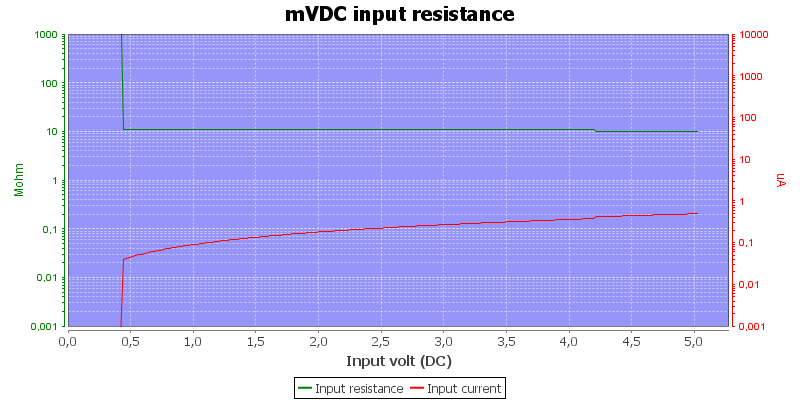 The input resistance at low voltage on DC range. 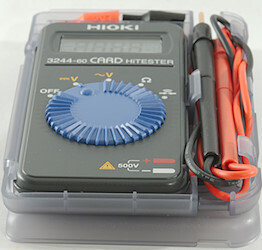 High DC voltage blocks for AC and high AC voltage gives wrong DC measurement. 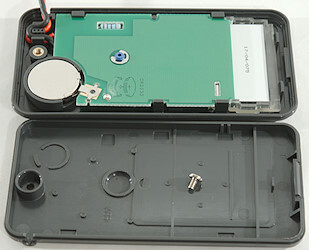 To open the meter one screw must be removed. To remove the circuit board a locking ring must be removed and a few tabs must be loosened. 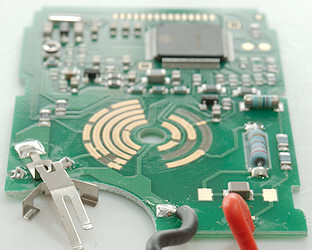 The buzzer do not use springs, but have some conductive rubber pins mounted above it for connection to the circuit board. The meter has one input path that goes through two SMD resistors (430kohm and 470kohm) and a MELF resistor (9Mohm). There is also a ohms and continuity output path, it has a SMD PTC, a leaded resistor (220ohm) and after the range switch a transistor to handle over voltage/current. 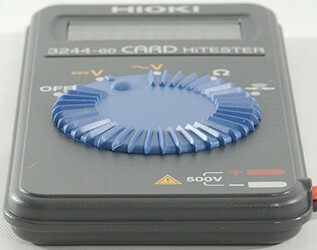 The actual multimeter chip is a Hioki custom chip and has a trimpot for adjustment. 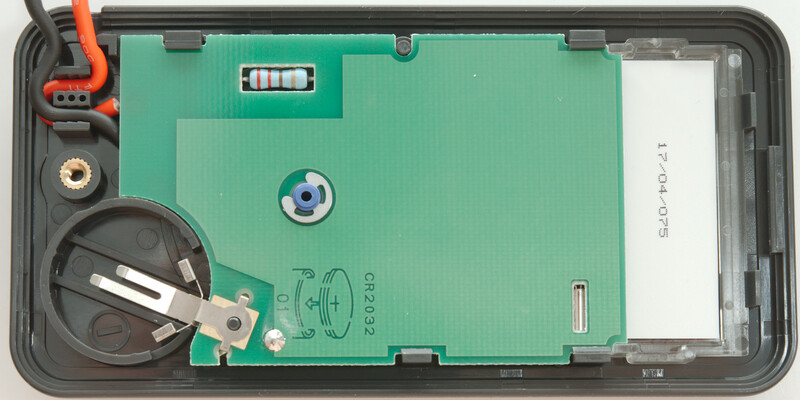 On this side only the positive battery contact is mounted and there is slots for a resistor and the crystal to keep the other side without parts sticking up and for the crystal also to keep it in position. 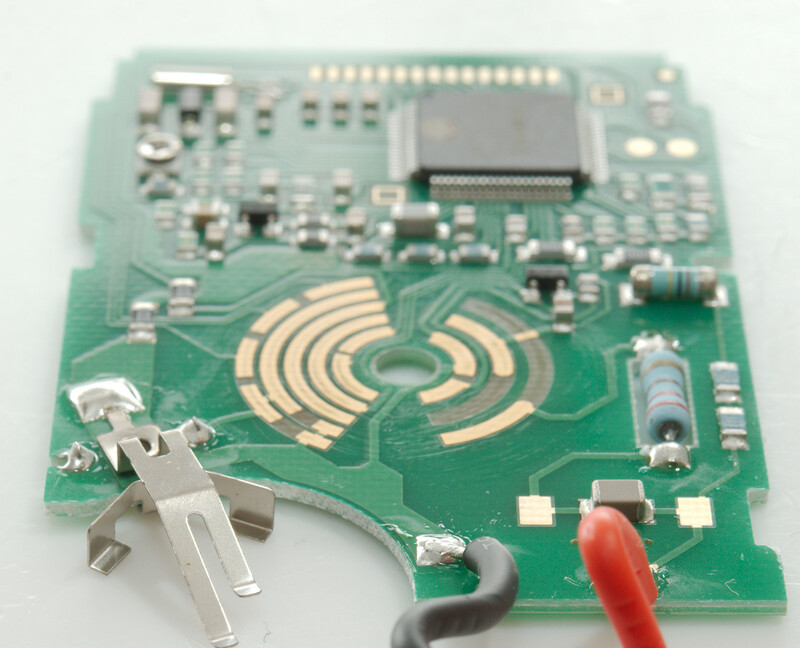 Most of this side contains copper, this will work as a shield for the electronic. 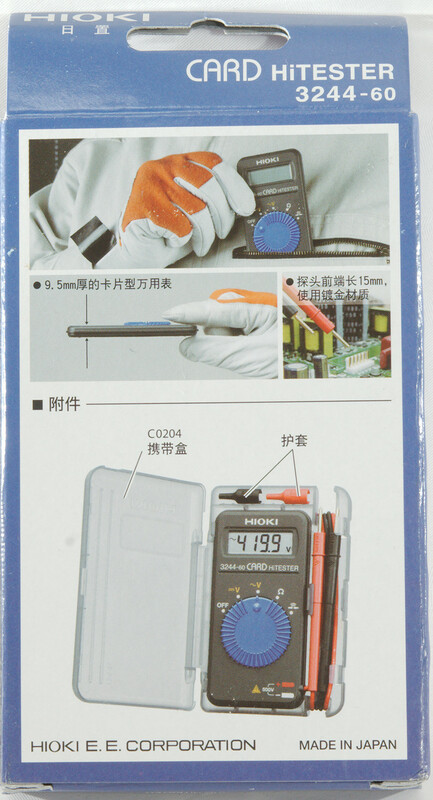 The safety looks good, but using a 600V CAT rating on a 500V rated meter is a bit strange. 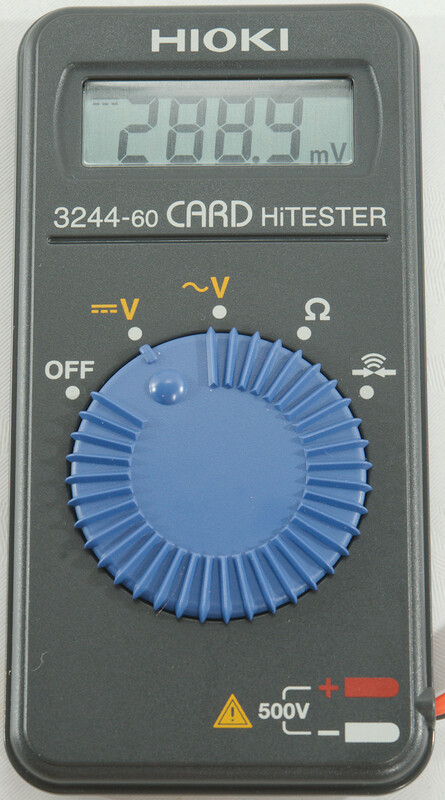 The meter is fairly simple with very few ranges, but it is the most important ranges it has.